1. While holding all the posts together, untie the green string and drop the netting away from the posts. DO NOT remove the strings from the post. They will be needed to re-tie the net when moving or storing. 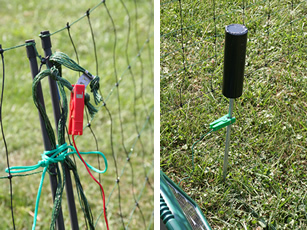 Lay the first post on the ground with the string attached at the net's starting point. Walk the fence line and drop each post in turn as it pulls. After the netting is laid out, clear the fence line of foliage or other matieral that will drain energy from the net. 2. Install by posts by placing the step-in part at a 90 degree angle/perpendicular to the net. Tension each section of netting before each post is installed. 3. To electrify all horizontal lines, connect jumper from power terminal of energizer to the clip on the green or orange bundle. Connect ground stake to the ground terminal on the energizer.